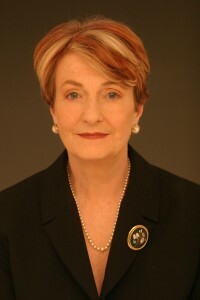 Dr Helen Caldicott is an Australian physician and a leading anti-nuclear activist. She is a widely respected lecturer and authority on the topic, and played an integral role in the formation of the organisations Physicians for Social Responsibility and International Physicians for the Prevention of Nuclear War. The latter was awarded the Nobel Peace Prize in 1985. She has won numerous prizes for her efforts, such as the Humanist of the Year award in 1982 from the American Humanist Association. Due to my personal concerns regarding the ignorance of the world’s media and politicians about radiation biology after the dreadful accident at Fukushima in Japan, I organized a 2 day symposium at the NY Academy of Medicine on March 11 and 12, 2013, titled ‘The Medical and Ecological Consequences of Fukushima,’ which was addressed by some of the world’s leading scientists, epidemiologists, physicists and physicians who presented their latest data and findings on Fukushima. Massive quantities of radiation escaped into the air and water — three times more noble gases (argon, xenon and krypton) than were released at Chernobyl, together with huge amounts of other volatile and non-volatile radioactive elements, including cesium, tritium, iodine, strontium, silver, plutonium, americium and rubinium. Eventually sea water was — and is still — utilized to cool the molten reactors. The Japanese government was so concerned that they were considering plans to evacuate 35 million people from Tokyo, as other reactors including Fukushima Daiini on the east coast were also at risk. Thousands of people fleeing from the smoldering reactors were not notified where the radioactive plumes were travelling, despite the fact that there was a system in place to track the plumes. As a result, people fled directly into regions with the highest radiation concentrations, where they were exposed to high levels of whole-body external gamma radiation being emitted by the radioactive elements, inhaling radioactive air and swallowing radioactive elements. Unfortunately, inert potassium iodide was not supplied, which would have blocked the uptake of radioactive iodine by their thyroid glands, except in the town of Miharu. Prophylactic iodine was eventually distributed to the staff of Fukushima Medical University in the days after the accident, after extremely high levels of radioactive iodine — 1.9 million becquerels/kg were found in leafy vegetables near the University. Iodine contamination was widespread in leafy vegetables and milk, whilst other isotopic contamination from substances such as caesium is widespread in vegetables, fruit, meat, milk, rice and tea in many areas of Japan. The Fukushima meltdown disaster is not over and will never end. The radioactive fallout which remains toxic for hundreds to thousands of years covers large swathes of Japan and will never be “cleaned up.” It will contaminate food, humans and animals virtually forever. I predict that the three reactors which experienced total meltdowns will never be dissembled or decommissioned. TEPCO (Tokyo Electric Power Company) — says it will take at least 30 to 40 years and the International Atomic Energy Agency predicts at least 40 years before they can make any progress because of the extremely high levels of radiation at these damaged reactors. This accident is enormous in its medical implications. It will induce an epidemic of cancer as people inhale the radioactive elements, eat radioactive food and drink radioactive beverages. In 1986, a single meltdown and explosion at Chernobyl covered 40% of the European land mass with radioactive elements. Already, according to a 2009 report published by the New York Academy of Sciences, over one million people have already perished as a direct result of this catastrophe. This is just the tip of the iceberg, because large parts of Europe and the food grown there will remain radioactive for hundreds of years. Iniencephaly as a result of radiation exposure (Photograph reproduced with permission of Dr Wladimir Wertelecki. See the film of Dr. Wertelecki’s presentation, "Congenital Malformations in Rivne Polossia and the Chernobyl Accident," given at the March 2011 Symposium). Alpha radiation is particulate and is composed of two protons and two neutrons emitted from uranium atoms and other dangerous elements generated in reactors (such as plutonium, americium, curium, einsteinium, etc — all which are known as alpha emitters and have an atomic weight greater than uranium). Alpha particles travel a very short distance in the human body. They cannot penetrate the layers of dead skin in the epidermis to damage living skin cells. But when these radioactive elements enter the lung, liver, bone or other organs, they transfer a large dose of radiation over a long period of time to a very small volume of cells. Most of these cells are killed; however, some on the edge of the radiation field remain viable to be mutated, and cancer may later develop. Alpha emitters are among the most carcinogenic materials known. Pioneering research conducted by Dr Tim Mousseau, an evolutionary biologist, has demonstrated high rates of tumors, cataracts, genetic mutations, sterility and reduced brain size amongst birds in the exclusion zones of both Chernobyl and Fukushima. What happens to animals will happen to human beings. This high-level waste must be isolated from the environment for one million years — but no container lasts longer than 100 years. The isotopes will inevitably leak, contaminating the food chain, inducing epidemics of cancer, leukemia, congenital deformities and genetic diseases for the rest of time. Caldicott H. Helen Caldicott Foundation’s Fukushima Symposium. 2013; A book of the Symposium, Crisis Without End (The New Press, 2014) is now available, as well as the original recordings of both days with some documentation, and high quality, no-commercial film versions at Vimeo. “Japan sat on U.S. radiation maps showing immediate fallout from nuke crisis.” The Japan Times. June 19, 2012. 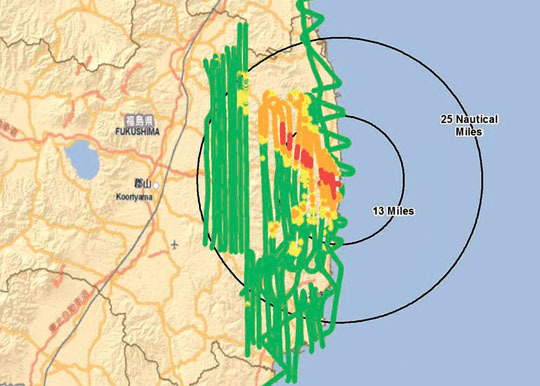 Fallout: Aerial monitoring results dated March 23, 2011, provided by the U.S. Department of Energy show that more than 125 microsieverts of radiation per hour were detected as far as 25 km northwest of the Fukushima No. 1 plant. Kyodo — The government failed to make use of detailed U.S. maps showing how radiation spread shortly after the Fukushima nuclear crisis began, sources familiar with the matter revealed Monday. The sources said the maps were neither publicized nor used to evacuate residents living near the poorly protected Fukushima No. 1 nuclear plant, which was racked by meltdowns and explosions after a massive earthquake and tsunami struck the area on March 11, 2011. From March 17 to 19, U.S. military aircraft collected radiation data in an area with a 45-km radius from the plant for the U.S. Department of Energy. The data showed that more than 125 microsieverts of radiation per hour was leaking as far as about 25 km northwest of the plant, meaning residents in the area were being exposed to their annual permissible dose within just eight hours. Before deciding to release the data on its own on March 23, the U.S. government provided the data via the Foreign Ministry to the Nuclear and Industrial Safety Agency — the regulator overseen by the Ministry of Economy, Trade and Industry — on March 18, and to the Education, Culture, Sports, Science and Technology Ministry on March 20, the sources said. “Tests find cesium 172 times the limit in Miyagi Yacon tea.” The Asahi Shimbun. April 13, 2012. Yablokov AV, Nesterenko VB, Nesterenko AV, Sherman-Nevinger JD. Chernobyl: Consequences of the Catastrophe for People and the Environment: Wiley.com; 2010. Fukushima Health Management. Proceedings of the 11th Prefectural Oversight Committee Meeting for Fukushima Health Management Survey. Fukushima Health Management Survey Results of Thyroid Ultrasound Examination. Fukushima, Japan 2013. Møller AP, Mousseau TA. “The effects of low-dose radiation: Soviet science, the nuclear industry — and independence?” Significance. 2013;10(1):14-9.